A fruity and sweet beer with typical Irish flavours. Greatly appreciated for its bitter, tangy taste sweetened by a touch of caramel. A wide success that brought the Kilkenny beer forward and set it as the hallmark beer of the town. 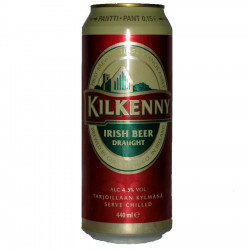 It is worth noting that Kilkenny has been referred to in a world-famous pun: the South Park characters allude to the beer when saying "They killed Kenny". Indeed, one of the South Park authors bet he could quote the name "Kilkenny" in each one of the episodes of the cartoon. Total success! The Kilkenny red ale is brewed in Kilkenny, in Scotland’s oldest brewery of Saint Francis Abbey. This old brewery also produces the famous Smithwick’s. Kilkenny is extremely popular in Canada, and develops a rich, creamy and caramelised taste with a hint of bitterness. Kilkenny beer is referred to in a quite famous play on words from the worldwide known South Park series. The characters, referring to the beer, often say “They killed Kenny”, as one of the South Park script writers bet on quoting the name “Kilkenny” in each episode of the animated series. Total success! Taste: a malted beer, quite round in the mouth, with a light lasting bitterness. A trail of caramelised barley makes it a full-bodied beer as it has a low sugar content. A light and fruity creamy texture. Quite refreshing.